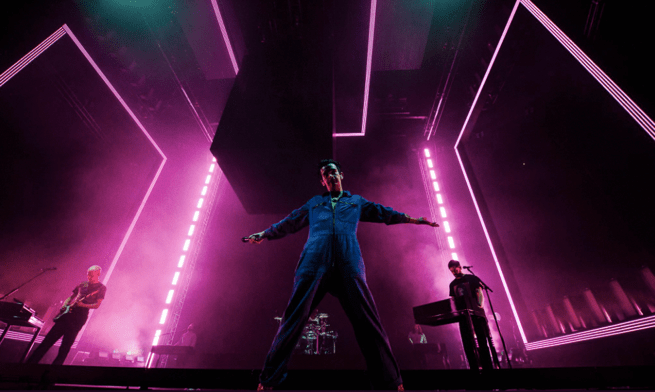 Mancunian pop-rock band The 1975 performed the second show of their new tour in the SSE Hydro in Glasgow on Saturday. With the excitement still alive from the release of their third studio album A Brief Inquiry into Online Relationships, it was bound to be a brilliant gig. As the lights go down and the crowd starts screaming, it’s clear that Glasgow is going to bring its usual unique twist to this date. The lively songs from their latest album, such as ‘Give Yourself a Try’ and ‘TOOTIMETOOTIMETOOTIME’ are met with absolute hysteria from the crowd as the words are sang back word for word. Whilst the slower, mellow songs create a change in the atmosphere, as the crowd is mesmerised by Healy and his ability to engage with the audience through effortlessly powerful lyrics and his luring onstage persona. Even treating Glasgow with two songs not yet sang on this tour, ‘Paris’ and ‘Be My Mistake’. The crowd (myself included) were put into a trance like state as we tried to hold in our tears. As the show continues with a slower pace, ‘Robbers’ is played, an absolute classic from their first self-titled album. Healy declares this song is a song for the fans and it reminds the crowd of why they fell in love with the band in the first place. Their performance is visually spectacular, making the whole gig feel like a truly lived experience. The stage is full of light boxes and glowing squares, a nod to the bands somewhat obsession with rectangles, (fans now have “box tattoos on their arms” as a tribute to their favourite band). Huge screens display a multiplicity of colours or appear to place themselves into giant smartphones. “Modernity has failed us” is blazoned in neon writing during ‘Love It If We Made It’, reminding the audience that behind their seemingly upbeat, catchy tunes is a more important message. This song being dubbed the ‘We Didn’t Start the Fire’ of the 21st century. Their success is attributed to Healy’s charisma as well as the way they’ve occupied a unique and once missing space in the current pop landscape. Therefore, appreciation for the rest of the band has to be made. The band consists of guitarist Adam Hann, bassist Ross MacDonald and drummer George Daniel. All three give The 1975 their recognisable sound, and provide the excitement that the band so clearly give their fans. During the encore, ‘The Sound’ blares out as criticism of their music flashes on a pink illuminated screen. At the end of the show, they vanish without a valedictory goodnight, instead a disembodied and unemotional voice booms out, emotionally repeating the word “goodbye”. And as the audience floods out the arena, song lyrics stuck in everybody’s heads, it’s clear that The 1975 know how to put on a show. As the screens so cleverly put early in the show, GOD BLESS THE 1975.